The Atacama Desert, located in Northern Chile, is the driest place on Earth. With absolutely no humidity and no recorded rainfall, the desert can be seen from outer space as a brown spot. Its topography is almost alien in nature, with the desert often being compared to Mars’ surface. And being over 7,000 feet above sea level provides astronomers with the best vantage point to view the cosmos. Luring scientists and engineers from all around the world, Guzmán assesses the nature of these astronomers arrival, whereupon he analyzes the people who have entered the landscape to those who inhabit it. Guzmán astutely connects the field of astronomy with anthropology – both fields deal with the concept of origin. But the people of Chile scan the Atacama Desert for something deeply personal. Under the brutal dictatorship of Augusto Pinochet, the people of Chile were subject to poverty and constant oppression. 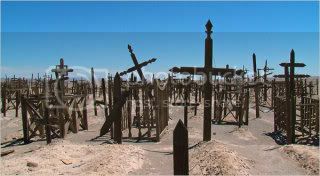 Those opposing Pinochet’s regime were immediately snuffed out, buried in mass graves in the Atacama Desert. Upon the news that Pinochet would be charged for with war crimes, petrified bodies were dug out and expelled into the sea. In an era that has largely been erased from Chile’s history, it’s only the women of the land who continue with their search – searching for remnants of their deceased husbands, fathers, and brothers. Meanwhile, Guzmán interviews various astronomers as they are on their personal quest for discovering the origins of the universe. One astronomer notes the key difference between their search and the searches that the women of Chile embark upon – one set of people are capable of going to sleep at night. The other group is burdened with a heavy history where sleep is a restless effort. With films like The Tree of Life, Melancholia, and Take Shelter questioning one’s position in relation to a greater cosmic force, it’s Nostalgia for the Light that most succinctly bridges the cosmic with humanity. Guzmán carefully formulates his thesis, wherein he relies on a fragmented sense of memory to express an understanding of the terrain and people of Chile. The various women he interviews throughout the film simply tell their tale, wherein they evoke a humanistic spirit in their refusal to forget about Chile’s troubled past. One touching interview sees a 70-year woman, weathered in her features from the harsh terrain, express optimism in finding the body of her husband. His corpse may be buried in the desert, in the Andes Mountains, or may have been dumped into sea. The resolve of this woman to recover the body remains unfazed. 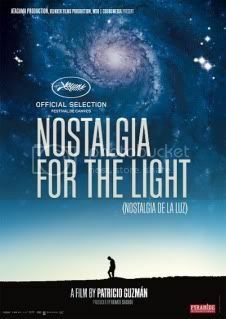 Nostalgia for the Light is one of the most thoroughly heartfelt and humanistic pieces of cinema that I’ve seen in some time. It operates on a scale that expands to a micro and macro level on a whim, though never falters as a relentlessly human piece. It’s ambitions are large, though Guzmán’s ability to unite the cosmic and terrestrial in a philosophical manner is masterful. The picture elaborates on the theme of human insignificance in the face of a cosmic entity by acknowledging that memory and history function as key components in measuring our worth as a civilization. In one of the film’s many virtuoso shots, Guzmán looks upon the marbles that he played with as a child. The significance and weight of these objects reflects that of a pocket universe, wherein our capacity for memory allows our worth to expand beyond that of the cosmos.